A NASA rover is only three days away from landing on Mars, and you can follow along with the adventure on the Red Planet thanks to a lineup of exciting public events. The car-size Mars Science Laboratory, which is also known as the Curiosity rover, is scheduled to touch down on the surface of Mars on Aug. 5 at 10:31 p.m. PDT (1:31 a.m. EDT Aug. 6; 0531 GMT). The rover will spend roughly two years analyzing the Martian environment for evidence that the planet is, or was, a habitable place for microbial life. But first, the Curiosity rover will have to survive the nerve-racking trip through Mars' atmosphere. NASA Television will be broadcasting live coverage of Curiosity's landing on Aug. 5 beginning at 8 p.m. EDT (11 p.m. EDT; 0300 GMT Aug. 6). You can watch NASA's live webcast here: http://www.nasa.gov/ntv. But there are also more events that are scheduled to take place in the days leading up to the historic Mars landing. This list is not meant to be exhaustive, and there are plenty of other public events that will be going on this weekend to celebrate the Curiosity rover's landing. Barbara Cohen, a planetary scientist at NASA's Marshall Space Flight Center in Huntsville, Ala., will discuss the history and future of the agency's exploration of Mars in an event that is free and open to the public. The event will take place at the U.S. Space & Rocket Center's Davidson Center for Space Exploration 3D theater in Huntsville at 6 p.m. EDT (5 p.m. CDT). The lecture, which will also be webcast live on Ustream, will highlight NASA's successful series of Mars rovers, from Pathfinder, to Spirit and Opportunity, to the Mars Curiosity rover. NASA Social, the agency's first-ever multi-center event will be held on Aug. 3 to preview the landing of the Mars Science Laboratory's Curiosity rover. Events will be held simultaneously at six NASA field centers, including Ames Research Center in Moffett Field, Calif.; Glenn Research Center in Cleveland; Goddard Space Flight Center in Greenbelt, Md. 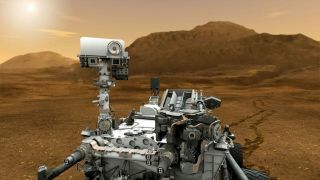 ; Johnson Space Center in Houston; and, Langley Research Center in Hampton, Va. Each center will be connected in a NASA Television simulcast with the Jet Propulsion Laboratory in Pasadena, Calif., where the Curiosity rover's mission is being managed. The Jet Propulsion Laboratory may broadcast a portion of the NASA Social program and live chat here: http://ustream.tv/NASAJPL. Or, you can follow along with the conversation on Twitter by using the hashtag #NASASocial. The Mars Society, a non-profit advocacy organization, is holding its 15th Annual International Mars Society Convention in Pasadena, Calif., from Aug. 3 to 5. The event will gather scientists, policymakers and other experts to discuss Mars exploration and efforts toward a manned mission to the Red Planet in the future. Scheduled speakers include John Grotzinger, Mars Science Laboratory's chief scientist; Peter Diamandis, founder and chairman of the X Prize Foundation; Jim Green, director of NASA's Planetary Science Division; G. Scott Hubbard, professor of aeronautics & astronautics at Stanford University, and Doug McCuistion, director of NASA's Mars Exploration Program. The non-profit Planetary Society will be hosting Planetfest 2012 in Pasadena, Calif., on Aug. 4 and 5 to celebrate the Curiosity rover's landing. The two-day event will feature presentations, family activities, art exhibits and displays of spacecraft and other space instruments. Participants will also have the opportunity to touch a real Mars meteorite and explore the cockpit of a commercial suborbital space plane. Scheduled speakers include Bill Nye, CEO of The Planetary Society; George Whitesides, CEO and President of Virgin Galactic;Jim Green, director of NASA's Planetary Science Division, Charles Elachi, director of NASA's Jet Propulsion Laboratory; Scott Maxwell, the Curiosity rover's driver, and Robert Zubrin, founder and president of the Mars Society. A live webcast of speaker presentations during Planetfest 2012 will be available at www.planetfest.org. Visit the Planetfest website for more information about tickets and scheduled events. The Reuben H. Fleet Science Center in San Diego, Calif. is hosting a Space Expo on Aug. 4 and 5 to celebrate Curiosity's landing. The event will feature lectures, games, hands-on activities, planetarium presentations, and live coverage of the landing. The Museum of Science in Boston will be holding an event called "Planetfest Boston" to coincide with The Planetary Society's Planetfest celebration in California. The event at the Museum of Science will be held from Aug. 4 to 6, beginning at 11:30 a.m. EDT each day. Participants will be able to see a 1/3 scale model of the Curiosity rover, and will be able to ask scientists questions about the mission. A live webcast will also connect the festivities in Boston with The Planetary Society's Planetfest in Pasadena, Calif.
And, the fun doesn't stop after Curiosity lands. National Geographic Channel will premiere a new documentary, called "Martian Mega Rover," on Aug. 9 at 10 p.m. ET/PT. The hour-long program will examine each phase of the rover's risky landing, and will feature behind-the-scenes footage from the eight years that it took to take the project from conception to touchdown on the Red Planet.